Emergency services successfully put out a fire on board a disused boat near Newhaven Harbour in the early hours of Tuesday morning, October 31. Newhaven lifeboat crew joined police, fire, ambulance and coastguard services called to the former fishing vessel at around 2.20am. While firefighters went on board to tackle the blaze, the RNLB David and Elizabeth Acland launched an inflatable ‘Y boat’ to stand by in case the fire crews needed to be evacuated from the river side. 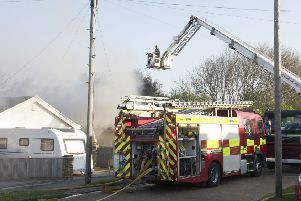 By 3.45am, the fire was under control and at 4.40am firefighters had put it out completely. A spokesperson for the lifeboat crew said one was injured in the incident.